Schedule Details & to Register! Responsibly skipper and crew an auxiliary powered cruising sailboat during daylight hours within sight of land in moderate wind and sea conditions. This course qualifies for ASA 103 Certification! After successfully completing this course you will be certified to rent or charter a 30-35 ft. sailboat locally or in the Caribbean. 20-25 ft sailing vessel is highly recommended. This course introduces the additional skills required to skipper a 30-40ft auxiliary sailboat on local lakes (such as Lewisville or Texoma) or in simple coastal waters (such as parts of the Caribbean). This 3 day course includes one day of classroom (or two evenings) and two days on the water. 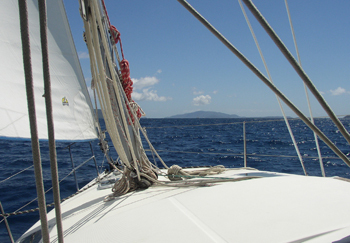 Our objective is to train competent skippers in the art of sailing and this course is no exception. We hold our students to the highest standards. We are not a certification factory. After completing this course, you will know what you are doing! This course is a very different from other North Texas sailing courses with a similar name. In fact, it is similar to most Bareboat courses offered locally in the Dallas/Fort Worth area! After completing this course you will be certified to charter a comparable vessel locally or in the Caribbean. Upon successful completion of the course, you will be awarded the ASA 103 Basic Coastal Cruising Certification. 2 days aboard a 30 to 35 foot auxiliary Sailboat. $749 per student ($100 discount for graduates of our Heavy Air workshop). Taxes/fees extra. Additional fees may apply for those needing additional instruction.